A sitemap is a file on your hosting server that lists all the pages at your website or blog. It is, in effect, a detailed “map” for search engine crawlers to find, see, and then follow as they crawl the pages at your site. You can leave it to chance that a search engine crawler will find all the pages at your site, or a better option is to create a sitemap and let the search engines know where your pages are and when you’ve updated them (i.e. ping for a new or updated page). 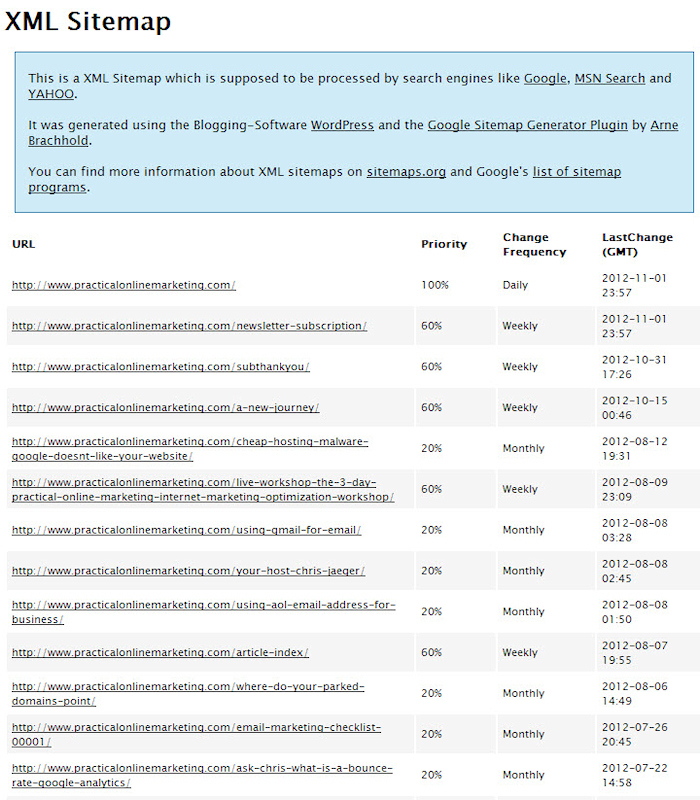 One of my favorite WordPress plugins for XML sitemaps is the Google XML Site Maps by Arne Brachhold. This plugin will generate a special XML sitemap which will help search engines like Google, Yahoo, Bing and Ask.com to better index your blog. It’s written by Arne Brachhold, it’s never given me a problem (i.e. stable), and I use it on all my WordPress sites and my client sites.